"I suppose we're all drunk on something." Seth Haines was in the hospital with his wife, planning funeral songs for their not-yet two-year-old, when he made a very conscious decision: this was the last day he wanted to feel. That evening, he asked his sister to smuggle in a bottle of gin, and gave in to addiction. But whether or not you've ever had a drop to drink in your life, we're all looking for ways to stop the pain. Like Seth, we're all seeking balms for the anxiety of what sometimes seems to be an absent, unresponsive God-whether it's through people-pleasing, shopping, the internet, food, career highs, or even good works and elite theology. We attempt to anesthetize our anxiety through addiction-any old addiction. But it often leaves us feeling even more empty than before. 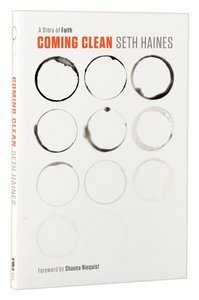 In Coming Clean, Seth Haines writes a raw account of his first 90 days of sobriety, illuminating how to face the pain we'd rather avoid, and even more importantly, how an abiding God meets us in that pain. Seth shows us that true wholeness is found in facing our pain and anxieties with the tenacity and tenderness of Jesus, and only through Christ's passion can we truly come clean. Seth Haines, author of "Coming Clean", writes at SethHaines.com and is a regular contributor to various publications.